WSU wins so Tulane goes in as the 8th seed . They will play Houston at 6 on Tuesday. You can watch it at 6 on the AAC network for free . Last edited by winwave on Sat May 26, 2018 12:48 pm, edited 2 times in total. That's Game 2. I wonder what time Game 1 will start? 7 AM? The game will be on CST locally, channel 1037. We may want to pay attention to this. I wonder if they would just cancel the tournament if the weather got bad enough. If they did Houston would get the automatic because of their regular season title. Good! The AAC also has a link on facebook. THANK YOU!!! Looks like our game will definitely start late. Fortunately they have moved back the time that they predict heavy chances for rain till 4. The last thing we need is for Gillies to go a couple of innings and a then lose him to a long rain delay. Yes. Going to be a long day for sure. Just a massive crowd behind the plate right now in Clearwater. I see --- one person, the camera man! LOL ECU leading UCF 8-4 in the 8th. Radar shows thunderstorms starting to form SE of Orlando. With the Tulane game not starting until at least 12:30, we may have some issues. I thought the same thing. Bring the tournament back to Airline Drive. Attendance there (Fla) has always been like that. The conference must take a financial beating on that tournament. I thought the same thing. Bring the tournament back to Airline Drive. Attendance there has always been like that. The conference must take a financial beating on that tournament. Tulane brings the AAC the nation's best city to host an event like a tournament. New Orleans is a natural, and the timing is right for baseball (after Jazz Fest, etc.) The AAC should consider New Orleans to host the Conference Championship game for Football and Conference Tournament for Basketball as well. And of course for Volleyball, too! Game one just ended. we start in 45 minutes. The tournament needs to be on campus otherwise there'll always be low attendance. East Carolina wins game # 1 8-4. The weather for game # 2 looks questionable. Bad weather in Clearwater at this time. Tulane-Houston start delayed. Pics compliments of BC Wave who made the trip. Going to be a long day. Game time is 1:47. 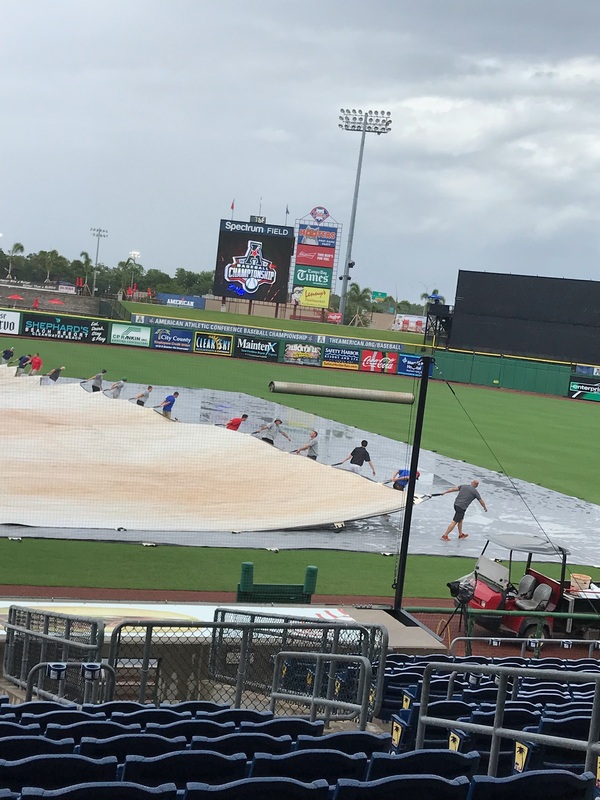 Graf said that due to weather there could be 4 games going on at the same time on the fields there in the Phillies minor league complex tomorrow. 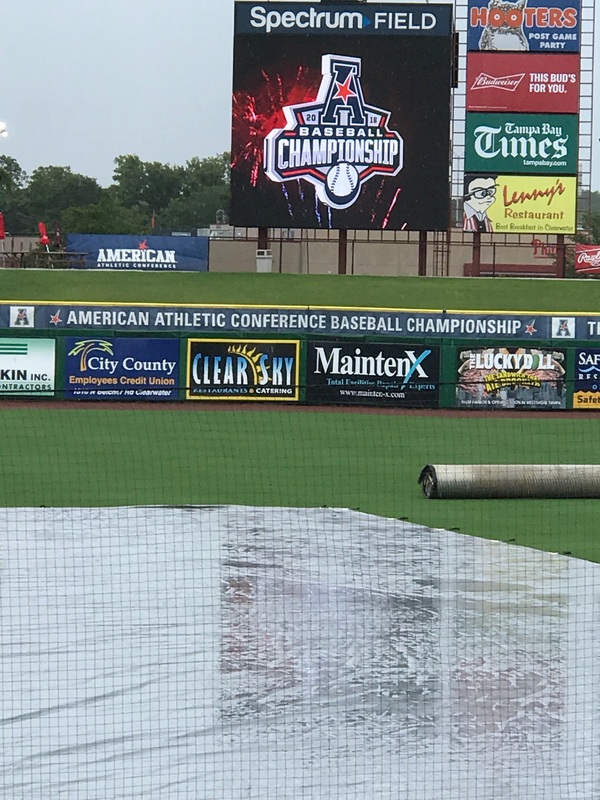 For today it looks like we have a window from 2-5 to get the game in. Last edited by winwave on Tue May 22, 2018 1:20 pm, edited 1 time in total. The hourly forecast on weather.com says there's only a 15% chance of rain between now and 5 PM EST, then it goes to 35% at 5 PM and 50% at 6. Let's hope we can get the lion's share of the game in without interruption. If there is another delay mid game, let's remember that both teams have to deal with it and make NO excuses. The year after next, the Mobile BayBears leave for Huntsville. I wouldn't mind have the AAC tourney at Hank Aaron Stadium.